This supra-national project turned out to be inadaptable to a unipolar world. The European Community sprang from the the civil chapter of the Marshall plan – NATO being the military chapter. The Western European bourgeoisies, frightened by the Soviet model, had been supporting the European Community since the Congress convened by Winston Churchill in The Hague in 1948. However, after the disappearance of the USSR, they no longer had any interest in continuing along this road. Taking into account the differences within the Euro zone, the small fry were destined to become the prey of the biggest of the sharks, Germany. The single currency which, at the moment it was put into circulation, had been adjusted to the dollar, transformed itself progressively into an internationalised version of the German Mark. Incapable of competing, Portugal, Ireland, Greece and Spain were symbolically qualified as PIGS by the financiers. While Berlin pillaged their economies, it offered Athens a restoration of its wealth – if Greece would hand over a part of its territory. First of all, Mrs. May was unable to conclude a preferential agreement with China, and experienced difficulties with the Commonwealth, with whom the bonds had been loosened over time. Next, she encountered problems with the Scottish and Irish minorities, particularly since her majority includes Irish Protestants who cling to their privileges. Besides that, she ran into the blind intransigence of Berlin and Brussels. 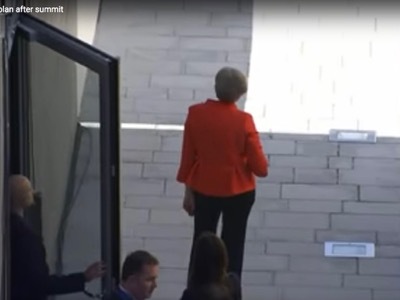 Finally, she will have to face up to challenges and questions about the « special relationship » which links her country to the United States. 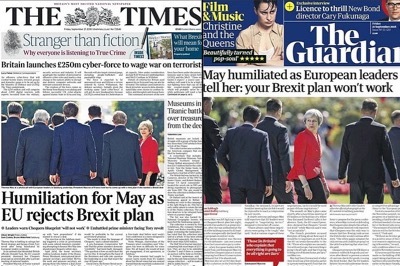 On 14 November 2018 – two years and four months after the referendum – Theresa May capitulated and accepted an unfavourable agreement with the European Commission. However, when she presented this deal to her government, seven of her ministers resigned, including the minister in charge of the Brexit. Clearly he had overlooked the elements of the text that the Prime Minister had assigned to him. Such behaviour can only lead to the re-awakening of the intra-European conflicts which triggered two World Wars – conflicts that the Union has masked within its own territory, but which remain unresolved and persist outside of the Union. The authoritarianism of the supra-national State has swelled to the point where, during the negotiations on the Brexit, it created three other fronts. The Commission opened two procedures for sanctions to be instituted against Poland and Hungary, (at the request of the European Parliament), accused of systemic violations of the values of the Union – procedures whose objective is to place these two states in the same situation as the United Kingdom during the period of transition – being constrained to respect the rules of the Union without having any say in their determination. Besides which, hampered by the reforms currently under way in Italy which are working against its ideology, the supra-national State refuses to allow Rome the right to build a budget in order to implement its own politics.